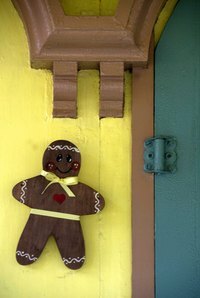 One of the most visible icons around the Christmas season is the gingerbread man. Gingerbread cookies are usually a favorite with children because they have lots of frosting and candy and are fun to decorate. A gingerbread costume can transform your child into a gingerbread man cookie that is perfect for holiday plays, Halloween or just for having fun around the house. This project takes about 1 day to complete. Lay the child or person who will wear the costume over the felt. Have him extend his arms out to the sides. Outline his body from head to toe with the chalk. You can outline the feet if desired, but it is not necessary. You will want to outline the head. Fill in any gaps in the outline with the chalk. Add about 3 inches to all measurements so that there is plenty of excess fabric. This is especially important around the head, which should look like the top of a gingerbread cookie. Cut out two of the outlines from the brown felt. Cut out an opening in the head of one of the pieces large enough for the child’s head to stick through. Sew the two pieces together. Turn the costume right-side out after sewing. Cut a slit below the head piece large enough for the child to step into. Sew some hook and eyes to both sides of the opening to keep it closed once the child is inside the costume. Hand sewing is the easiest way to attach the hook and eyes. Add gingerbread designs and accents to the costume to make it look like a gingerbread cookie. You can make these as simple or as elaborate as you want. A classic look is a white line around the edges of the costume with large colored buttons down the middle. You can even add pom poms or other 3D embellishments to add more interest to the costume.